The next steps are to tie local community networks to the high-speed fiber-optic cable. UC Santa Cruz will link its networks, giving it a second connection to the internet backbone to supplement a fiber-optic line from Sunnyvale installed in 2010. UC Santa Cruz researchers and students use massive amounts of data for work in genomics, astronomy, and big data, among other projects. Data are transmitted on fiber-optic networks via pulses of light, allowing network capacity to increase by factors of 100. The university has been linked to a statewide ultra high-speed network since 2010, but campus information technology planners recognized the vulnerability of having only a single connection coming from the north. “This was a total win-win,” said Steve Blum, president of Tellus Venture Associates of Marina, who specializes in developing new community broadband systems. “UCSC got much-needed fiber capacity and, as a result, the Salinas Valley has the same broadband internet that people in Santa Cruz take for granted.” Previously, broadband service in the Salinas Valley was “pretty dire,” Blum said. The financial key to the project, Smith said, was that the California Public Utilities Commission was looking for proposals to increase broadband access to areas with poor service. 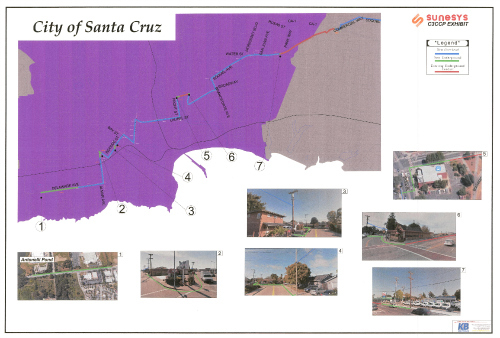 In 2012, Smith, in his role as ITS director of research and faculty partnerships, and UCSC network engineer Jim Warner coordinated the Connected Central Coast Unserved and Underserved Broadband Project to document existing internet service in communities from Watsonville south. “We made the case that we would be serving 11,000 underserved households,” Smith said. Armed with the data, UCSC partnered with CENIC (the Corporation for Educational Network Initiatives in California) and Sunesys, a telecommunications company that installs and leases fiber-optic networks, to apply for funding from the California Advanced Services Fund, a CPUC initiative that promotes deployment of high-quality advanced communications services in the state and funded by a small surcharge on every California phone bill. In April 2014, the state CPUC approved a $10.6 million grant to Sunesys that would cover 80 percent of the estimated $13.3 million cost. Approximately $500,000 in campus funds was used, Smith said. He credited strong support from community organizations and leaders throughout Santa Cruz and Monterey counties in helping secure the grant. The new fiber-optic backbone would bring the potential of high-speed broadband to schools, homes, and businesses throughout the region. Installation of the 91-mile line was completed at the end of last March, said Steve DeFranco, Sunesys director of sales for the western region. Now, “last mile” projects have begun, bringing faster, less costly, more reliable, and higher capacity broadband from the new backbone into Central California colleges, universities, K-12 schools, homes, and businesses. Cruzio, a Santa Cruz retail internet provider, has already connected to the high-speed line in Santa Cruz and is establishing a hub for similar service in Watsonville, using the fiber that runs south. Other internet providers are working to build out projects in Gonzales and the southern Salinas Valley. An additional benefit, said Blum, is that other providers, such as AT&T and Charter Communications, have started upgrading their networks in the Salinas Valley and elsewhere in order to remain competitive. In 2014, UCSC’s Connected Central Coast project won a UC systemwide IT award for information technology.